A GAMER'S WIFE: It's Beginning to Look a Lot Like... Christmas? I was checking out people's bead sprite artwork online, when I stumbled upon Doctor Octoroc. Not only has he made massively complex bead sprites, but he is also an incredible musical genius. This man took popular Christmas songs and remixed them to the tune of famous video game soundtracks. 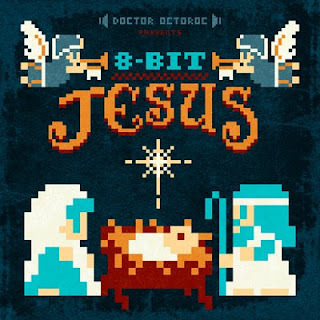 Just released a few months ago, the full album is titled 8-Bit Jesus: Classic Christmas Songs in the Style of Classic NES Games and can be downloaded for free or ordered for a $15 donation. I haven't played many, well, any old school games, so the only theme I recognized was from Super Jingle Bros. K, on the other hand, was absolutely enthralled by this find, so share this with anyone who wants a shot of nostalgia.